This is the first scholarly work to place the function of fund raising within the field of public relations, redefining it as a specialization responsible for the management of communication between a charitable organization and its donor publics. Combining her academic interest in communication with her experience as a fund raiser, the author has produced one of the few critical studies on fund raising, challenging current perspectives and employing systems theory and the concept of organizational autonomy to lead to a new and different approach. Until now, fund raising has been an anomaly, without an academic home and with few general theories to guide practitioner behavior. This book theoretically grounds fund raising and develops a theory that provides a fuller understanding of one of the fastest growing occupations in the nonprofit sector. Contents: Preface. A Critical Analysis of Fund Raising: An Overview of the Book. The Problem Prompting the Book: A New Function Taking on Increased Importance. Part I: Current Perspectives of Fund Raising: Confusing Definitions, Sporadic Research, and Myths. A Critical Analysis of Definitions Related to Fund Raising. An Analysis of the Body of Knowledge: A Need for Research. Myths and Misinterpretation of the Fund Raising Function. Part II: Systems Theory and Autonomy: Approaching Fund Raising From a Macroperspective. Systems Theory: Charitable Organizations and Their Environments. Institutional Autonomy. Autonomy and the Three Sources of Gifts. Three Case Studies on Autonomy. Part III: Shifting the Public Relations Paradigm: Approaching Fund Raising From a Different Perspective. The Fund Raiser in a Boundary Role. Fund Raising as a Specialization of Public Relations. Corporate Public Relations: A Precedent. Part IV: Using Public Relations Theories as Analytical Tools for Explaining Fund Raising. Four Models of Fund Raising. Measuring the Effectiveness of Fund Raising. Presuppositions About Fund Raising. Part V: A Theory of Donor Relations: Conclusions and Directions for Future Research. Conclusions and Directions for Future Research. ".explores how your organization is doing in managing donor relationships. Kelly says fundraising and PR must be completely integrated-they're two sides of donor relations. 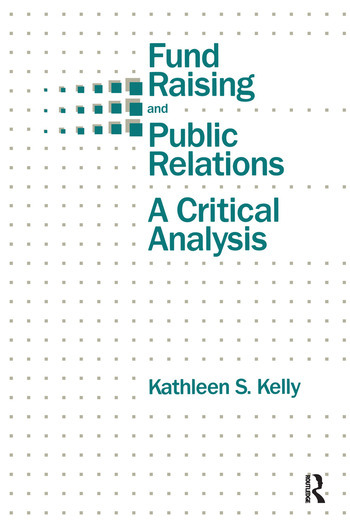 She identifies four major types of PR which influence fund raising, stressing the donor's need and how that need-not the organization's-will be met through this financial relationship..Kelly's book, thoroughly researched and deep, will help you think through the implications.it's worth every penny." "In the fund raising world, this book will be seen as `radical' and for this she is to be commended." "Kelly's work is as solid as it is far-reaching." "The success of this [book] comes from Kelly's inclusion of sage research and methodology....Her exploration of ethics and accountability will inspire those who find little depth in the philanthropic press." "I applaud Kelly's bold efforts to conceptualize the fund raising function within an organization-environment framework and to redefine the function as a specialty within the field of public relations. Neither function is particularly well respected nor understood." "...her dissertation, upon which the book was based, has won the John Grenzebach Award for Outstanding Research in Philanthropy." "I am having an absolute ball with my Fund Raising and PR class -- thanks to your superb book!" "...strongly-researched book reads well and persuasively....You have stimulated and modified my thinking on this subject in a very large way." "The one important exception to the dearth of useful books on development is Kathleen Kelly's recent groundbreaking book....the first to attempt to provide a theoretical context for fund raising." "Nothing this good has ever been written about fund raising." "...a remarkable achievement. It is an important, comprehensive, and helpful book." "The questions it raises provide fertile ground for future research and debate." "If there were a Top-Ten List for books about fund raising, this one would be on it." "It is a seminal work...I immediately ordered 10 copies to give to some of our presidents." "...breaks new conceptual ground and offers the public relations field an exciting new perspective of the natural linkage between fund raising and public relations."